Cut 4 x 45cm pieces of thread and 1 x 15cm piece of thread. Use your measuring tape or ruler to make sure you have cut your thread the right length. 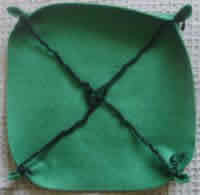 Tie one end of each thread to a corner of your napkin or felt cloth. I used a piece of felt cloth that is 20cm x 20cm. 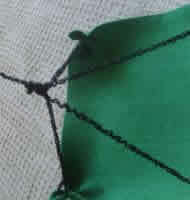 Tie the four loose ends together and tie the 15cm piece of thread to the point where they meet. 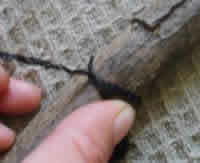 Tie the bottom end of the thread around your piece of driftwood. You can also use a cork or a plastic spool. This is what your parachute should look like. Holding the parachute by the top centre, throw it upward into the air and watch it float down.